Doctor Katarzyna Zakrzewska is a graduate of the 1st Faculty of Medicine at the Warsaw Medical University, which she graduated in 2013. 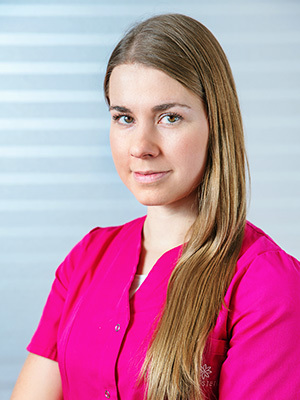 She works at the Dermatological Clinic of the Military Medical Institute in Warsaw and constantly extends her knowledge in the field of dermatology, especially interested in the dermoscopy of skin lesions. In 2016, she obtained a diploma of aesthetic medicine doctor at the Medical University of Warsaw, also participated in numerous courses and trainings in the field of aesthetic medicine and anti-aging. At the Institute of MEDESTETIS she deals with, among other things: correction of the face oval (lips, cheeks), application of botulinum toxin in the treatment of mimic wrinkles and hyperhidrosis, application of hyaluronic acid fillers to eliminate wrinkles and furrows; revitalization of face and body skin with the help of such treatments as: mesotherapy, medical peels, treatments with platelet-rich plasma, and numerous treatments using ultrasound waves and lasers. In her daily work, she most values the holistic approach to the patient. The most important is the prevention of health and beauty. Patients are encouraged to perform prophylactic examinations, physical activity and the use of a healthy and natural diet. Privately, she is interested in issues related to psychology and self-development. In her free time he rides and runs. Her main passion is traveling, and her dreams are the greatest trekking across Alaska.